Old Hat is an almost-all acoustic album. The Brains Behind Pa select some of their favorite traditional folk and blues songs to reinterpret. From the cowboy disaster story in "Trail of the Buffalo" and the bluegrass-tinged, Elizabeth Cotten classic, "Oh, Babe It Ain't No Lie" on through to the lonesome cry of "Soul of a Man" and the beauty of "Gospel Plow." Old Hat captures a band showing their respect for traditional material, but also revealing their desire to make these songs their own. 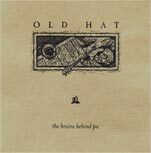 Old Hat has received airplay on college and independent radio across the U.S., Canada and Europe.